Our apartments have been undergoing some (read a lot) of construction this summer. Most of it has centered around repairs to the outside walls. This involves ripping down the textured concrete, installing new backing and mesh, before slinging the new concrete onto the wall. They will then come by and re-texture and paint the newly applied concrete. This is great because our wall was previously bulging out and needed repair. 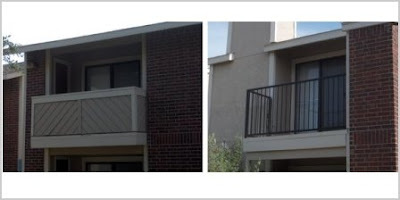 One repair we didn't see coming was on our balconies. All of the wooden half walls on the balconies are being replaced. We loved the half wall. it blocked off the balcony and gave it a sense of privacy, making it another room in the apartment. Now the wood is being replaced with metal square tubing, that offers no privacy leaving the balcony exposed and open to everyone around. While the rails look OK, we loose the privacy and the additional room in the apartment. Each time we sit outside, we feel like the world is watching. Plus we must keep the balcony clean because it is in plain site of all. And others, whose balconies are not so clean, are in plain site to us. I never knew how much we liked the wooden balcony rails and wall until they are being replaced. Luckily, ours is still wood for now. Who knows, maybe metal will become too expensive and we'll get to keep ours. We can always hope.